We woke up in the morning in Bennett’s Harbor with every intention of taking a walk on that lovely beach and exploring the area around us. Unfortunately… there are forces against us. Time: We have friends from home coming to visit White Pepper in Marsh Harbour, Great Abaco. We would REALLY love to be able to get there to see them. So once again, we are trying to hurry through the islands and unfortunately, the second factor - weather - is not cooperating. In order to have any chance of getting to Marsh Harbour in time, we must take advantage of favorable winds to get us to the next island (and the next factor) up the chain… Eleuthera. All of these factors combine to make our choices quite uncomfortable. The winds were forecast to clock around to the west due to continued late season cold fronts dropping down. Eleuthera is a long island with nothing to offer on it’s east side in the way of protection, and very little protection from westerlies along it’s west coast. We really needed to make time leaving Cat Island in hopes of arriving to Rock Sound in one day. That would be a trip of around 60 nautical miles. With good winds we could make that in a day… but. The OTHER deciding factor when sailing in the Bahamas is daylight. Most of the time, it is prudent to leave and enter an anchorage in good light with the sun behind you so that you can see the scattered and uncharted coral formations that could ruin your day. We finally had to furl the sails and motor along the west coast of Eleuthera in sloppy seas that had the cats glaring at us with that sick look once again. 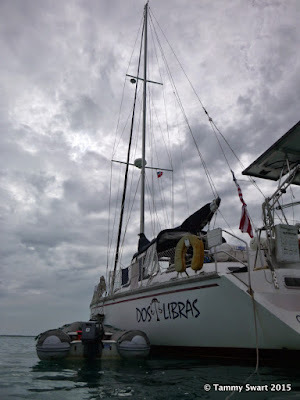 We motored out of the sunshine and slipped beneath a huge blanket of cloud that had been covering most of the islands to our north and finally had to give it up and look for a place to spend the night. The complicating factor was that the winds were from the west and we had nothing to block the waves coming across the sound from rolling us all night long. The good news is that the dying winds allowed the waves to calm considerably so it shouldn’t be so bad. We picked a spot on the chart and dropped the anchor in what LOOKED like sand. We dropped the dinghy and went to check our anchor with the lookey bucket and found it sitting on it’s side atop a slab of solid rock… We pulled the anchor up and moved north then tried again. We could feel the anchor bouncing along the bottom by the vibrations in the chain. We tried letting it drag for a distance in hopes that it would find a bit of sand to bite… no luck. Twice more we picked up and moved and twice more we were disappointed. What to do. It’s getting dark and there are rain squalls in the distance. We took a look at radar and saw that we would be out of the line of squalls. The light winds and the fact that if we DID drag there was nothing to hit made our decision to just let it lie there for the night a tiny bit less uncomfortable… but we set a drag alarm and settled in. It had been a long day and we were tired. In the morning we were up early and moving on. Our gamble had paid off and we hadn’t moved an inch overnight. But our luck had run out and those squalls were bearing down on us hot and heavy. We decided that it would be better to make a run for Rock Sound with limited visibility and light rain instead of waiting until the afternoon whin it might possibly clear. Bruce put on his foul weather gear and sat on the bow on coral watch while I guided the boat out and around the Cape and into Davis Channel. Jetsam is thinking "lunch would be nice..."
There are shallows and many coral formations requiring strict attention be paid, and with the limited light we were both on high alert. But the seas were flat and the winds light to nonexistent… and we had the rising tide with us so the depths never really caused us any concern. We had a lot of rain but that was the worst of it… so eventually Bruce came in from the rain and we realized that we hadn’t had breakfast. Our hasty departure also meant that there was no pre-prepared lunch for us so Bruce scrounged up some cheese and summer sausage that would have to tide us over until we were safely anchored. The rain began to lessen as we neared our destination. The banks would have been stunning in full daylight. We found several boats already anchored and took our spot near the Batelco tower in hopes of getting wi-fi on the boat (nope) We dropped anchor (it bit the first time) and settled down to rest. The town looked inviting but we chose to stay on the boat for the afternoon. The rain stopped and the mugginess started. Before long, even with the near complete cloud cover, we were warm enough to take the plunge. This is how we had anticipated MOST of our afternoons to be before we started cruising. We thought we would float off the stern with beverage in hand almost ever day. But for one reason or another, these moments have been precious few and we were elated to be having one now. We toasted our arrival and the choices we had made, both good and bad, to get here… and enjoyed our ultimate success on another day done.